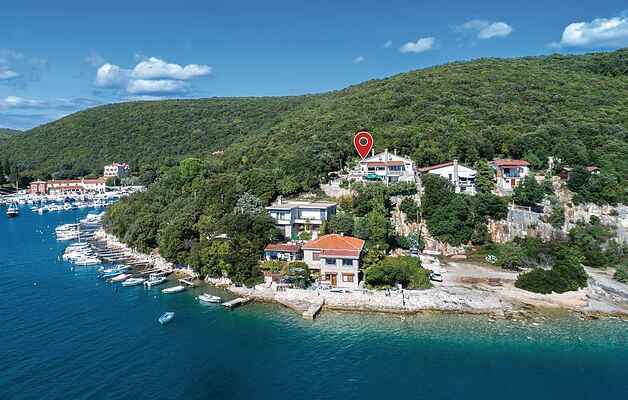 In the small fishing village Krnica, surrounded by Mediterranean nature and in the immediate vicinity of the sea, there is this special and charming holiday apartment. The apartment has two bedrooms, a living room, a kitchen, a bathroom and two nice terraces with stunning sea view. Here you can start the day with a coffee and enjoy the view over the bay. In Krnica you will find peace and relaxation, away from the crowds with countless hidden little beaches waiting for you. Stairs leads to the rocky beach, about 20 meters away. Enjoy the panoramic view of the sea and the beautiful bay of Krnica.